Alo Ciudadano extended by 30 minutes the time slot of its show. Thus Marcel Granier was all the way for 1.5 hours on TV, at a peak hour. No cadena for a change though we got the unbelievable decision of the TSJ promoting the illegal robbery of propriety. At 8:30, after one and a half hour of intense TV pressure Granier gave a dignified, gracious, restrained but adequately emotional speech. I was so impressed. And then all the staff working at that time in Globovision, including its director Ravell, came on camera to take turns to hug Granier, to congratulate him for his dignity and his valiant fight against the might of the totalitarian state. A moment of public class if I have ever seen one. Think for a second about the Cisneros or the Cameros of this world, who went as far as forbid their journalists at Venevision or Televen to support RCTV. Not to mention chavistas such as Earle Herrera or Desiree Santos Amaral who went from a life of fighting for freedom of expression to legislate its demise in Venezuela. Then at 8:30 it was time for the nightly news of CNN en español, and to my great surprise (I cannot follow the news during my day at work) I saw the tanks of the Nazional Guard rolling in Caracas early today. What is the government afraid of? 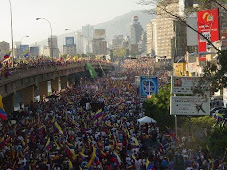 What could possibly the Venezuelan opposition do to stop Chavez from closing RCTV? What weapons do we have except for the pacific marches that we have done all along? We cannot even go to court as their access to us is closed for all practical purposes. But that is Chavez style, show of force, bullying the other side even if it is not necessary. In front of Granier's grace and poise we can oppose Chavez's histrionics and vulgarity. Chavez gross cadenas where he insults people who cannot reply are easily matched by his display of military force, confirming, astoundingly today, that Venezuela is for all practical purpose a military dictatorship, where the army is there to serve the power in place, not the people, not the nation, but the military leader. It is there, visually for all to see, with that astounding image of CNN where dozens of motorbikes in close formation, rode by armed Nazional Guards, followed by tanks, were rolling through the congested highways of Caracas. But that is Chavez, the pure product of military low life, of cheap barracks and cheap ideas. A mere "teniente coronel" who did not benefit from the polishing graces of reaching command positions, assuming he could have benefited from that. He is just the latest avatar of the South American XIX century bully, who measures his manliness as to how many soldiers he can place in front of the other guy. A luminous day for those who have eyes that can really see.